Filipinos enjoy to travel specially during holidays and since the Christmas Season is near and it will be the longest holiday ever, I am sure that most family will go and travel. As a parent myself, I would like to share my recommendations on the important travel essentials for health conscious Filipinos. 1. Water. For me water is the most important of all your travel essentials. A safe drinking water wherever you go should be ready and whenever you have the chance to replenish it while on travel please do. Extreme changes in weather might occur or sudden emergency, and for this water is needed most of the time. 2. First Aid. 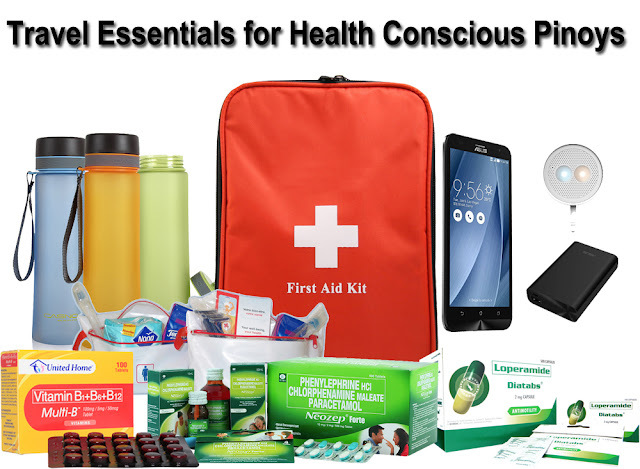 If you are travelling don't forget to bring a first aid kit consisting of important and primary medicines. Unilab had a variety of products that could be included in this kit but for me I would suggest you bring in Diatabs - since overeating might occur and diarrhea is likely, Neozep - the cold weather is very conducive to colds and fever and vitamins and minerals - in this case I would bring Multi-B since my kids are in need of Vitamin B Sipplement. 3. Communication Devices. Don't forget to bring your mobile phones on the trip and charge them well. Bring a power bank if needed. You never know if you will end up in the middle of no where and you need to contact some one. 4. Survival Kit. yes include this, items such as knife, flash light, and among other things might just save your life. I am not hyper but the world is really a dangerous place. 5. Personal Hygiene Kits. Don't forget to take care of yourself while on travel. You can check out Unilab's health and wellness products and add them to your own kit. Keeping yourself healthy is a priority since travel is supposed to be fun and educational. Don't forget to bring your toothbrush, cotton buds, nail cutter, shaver, and other necessary things to keep you well and good looking. 6. Camera. Well you can bring a separate DSLR camera or digicam but your mobile phone will also do. Never miss a memory of your travel so make sure that you take a photo or viddeo of your experience. Of course these are not the only travel essentials that must be considered in travelling. Each person and each group may have additional essentials that they will consider. If you want to share your own travel essentials you can also share it by commenting on this post. Enjoy travelling, be safe and don't forget your travel essentials. Things that reason interruption to this Dosha are dread,https://tadalafilgen.com/ pain, remaining up past the point of no return, utilization of dry sustenance and eating too early after a past feast.